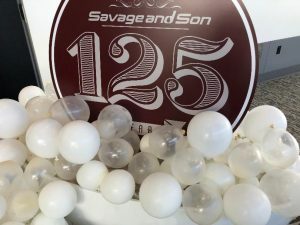 RENO, Nev. (KOLO)- Nevada’s oldest contractor, Savage and Son Inc., a provider of full-service Plumbing, HVAC and Piping, is celebrating its 125th anniversary of being in business. Established in 1893, Savage and Son has the oldest active contractor’s license in Nevada. “Historical, speechless, it’s a proud moment,” says Savage and Son President Len Savage. Hundreds gathered at the Reno-Sparks Convention Center to celebrate the milestone, including Governor Brian Sandoval. “It’s unprecedented, we’ve been trying to do the research and we’re not aware of any business in state history that’s been continuously operating like Savage and Son,” says the Governor. “So it speaks to the character of that family, it speaks to its dedication, to its mission, which is to serve people in Northern Nevada. The family business ties its roots back to the early mining days in Virginia City and has been passed down through five generations of leaders. During the anniversary event Savage and Son gifted a check donation to the Fourth Ward School Museum in Virginia City. “That’s where our roots were and that’s why we wanted to give back because of where we started,” says Savage.